Preheat the oven to 350°F. Spray a 9-inch by 5-inch loaf pan with cooking spray. Set aside. Combine the butter and brown sugar in the bowl of a stand mixer. Using the paddle attachment, mix on medium speed until the mixture looks smooth (2-3 minutes). Add the eggs to the mixer one at a time, beating well after each addition. Add the vanilla and bananas and beat to combine. In a small mixing bowl, sift together the flour, baking powder and salt. With the stand mixer running on its lowest speed, add the flour mixture to the mixer a little at a time, until it's all just combined. Stir in the cinnamon chips. Pour the batter into the prepared pan. Use a spatula to even it out in the pan. Slide into the oven and cook for 50-60 minutes, until a toothpick inserted into the center comes out cleanly. Looking for a fabulous new take on banana bread? Banana Cinnamon Chip Bread is a rich, delicious, moist loaf perfect for anytime. Everyone has a recipe for banana bread … or 20. There are so many variations and flavors and varieties. I know people who admittedly never make the same banana bread recipe twice, because they are searching for the perfect recipe. And they make banana bread often. Now, I am not sure if a perfect banana bread recipe exists, but I am all for new and fabulous takes on this classic. This Banana Cinnamon Chip Bread is fabulous, for sure. 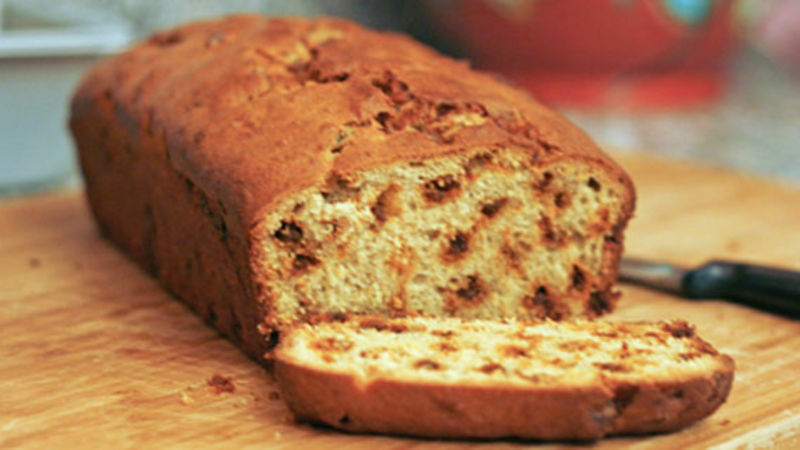 It has little pockets of cinnamon dotted throughout the fabulous, moist banana-y bread. And as far as bread-baking goes, making banana bread is pretty simple. You mix the ingredients (it’s like making cookie dough, really), then pour it into a pan and bake. Prep is 10 minutes max and after that, it’s all hands off. Finally, a note on cinnamon chips. If you haven’t tried them before, you should. They add a nice kick to recipes. Find them in the baking aisle near the chocolate chips. So, do you have a banana bread favorite? Dish in the comments!